For many individuals, growing up with a pet inside of the home is common. Chances are that your kids will continue the trend of having a pet indoors once they start their own family. There is no denying that pets are some of the best companions around. Their excited faces when you enter the home and the cuddle sessions after a long day’s work are just some of the reasons that we love pets so much! Keeping a pet indoors can become difficult. Cleaning up the fur tends to be manageable for most, however a flea infestation is not something to tackle on your own. If you live in Minneapolis and have noticed fleas around your home, contact Eco Tech today so that we can get a flea extermination specialist out to your house quickly! Fleas can irritate your pet’s skin and can even affect humans. 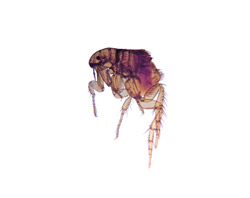 Fleas most popular animal targets include dogs and cats. If you feel a flea on your body, there is a high chance that your pets have already been dealing with these pests. Additionally, fleas reproduce incredibly fast. Female fleas lay approximately 50 eggs per day on your indoor pets. These eggs do not just stay on your pets. They can drop off of your 4 legged companion and find their way onto your couch, carpet or even bed! Getting rid of fleas after they have invaded your home is much more difficult and costly than catching them early on. So, getting help immediately is key when it comes to flea prevention. Everyone knows that bathing your animals regularly helps reduce the likelihood of fleas coming into your home. There are times however that fleas are able to enter into your home even when your pet is clean. At Eco Tech, one of our flea removal professionals is able to humanely treat your entire home and yard for fleas, significantly reducing these pests. Our treatment process also includes a prevention dynamic that helps keep these critters away from your home for good. Your family and pets will not be harmed during the flea removal process, thanks to our all natural extermination products. Don’t let fleas be the reason that you turn your pet into an outdoor companion. Instead, team up with Eco Tech today to help manage and remove fleas from your home. If you live in Minneapolis, MN, give us a call today at (763) 785-1414 to set up a flea removal inspection. You’ll be able to play and cuddle with your four legged friends flea free in no time!